Ken McCarthy pulls back the curtain on private communications he's had with System Club members over the years. What is the System Club? The System Club is the most exclusive organization in Internet marketing. There's only one way to become a member - or even learn about its existence - and that's by attending a live System training or by personal invitation to join. These letters - fifty-seven in all - were written to be absorbed quickly and deliver hard hitting, targeted marketing tactics and inspiration. The purpose of these letters is to help you think like a marketer and businessperson and hopefully become a better person in the process. 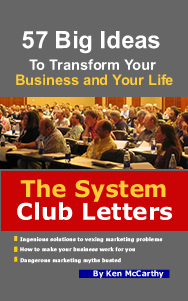 "Ken's 'System Club Letters' book is the most thought-provoking and inspirational marketing book I've ever read. I can see why people pay $1,000 per year to access this kind of information. I told my entire list about your book and urged them all to read it, too. In fact, I think the chapters about jazz, your father, and Independence Day should almost be 'required' reading for everyone in business." "Ken McCarthy is the most highly respected teacher of Internet marketing on the planet. I personally attend every conference he puts on, I buy every tape he creates, and I read every email he sends out. When I listen to this man, it puts money in my bank account without fail. "I've been actively involved in eCommerce and Internet marketing at a high level for the last 14 years. The System Club Letters brought me back to earth and helped rekindle my enthusiasm for what I'm doing. At only 234 short pages, it provides more sound advice and foundation than courses and seminars I have easily paid $2,000 or more for." "Ken's mastery of marketing reminds me of martial arts - galactic skill delivered in simple, elegant moves." "Ken, you don't put up with mediocrity in your seminars, products you sell, or anything that affects your reputation. There's a lot of old-fashioned value and goodness in what you require of yourself and people you endorse. You have a consistently higher standard than what others are willing to tolerate. You are a hound dog for history: If I want a historical perspective on something, I can always count on you to give me an angle I hadn't heard before. You have a sharp eye for repeating patterns and underlying causes and you also have a gift for stating those things clearly and succinctly. You can clearly discriminate the difference between fads and trends. You have a dislike of fads but a willingness to use them to your advantage. You have a love of seeing trends before they're apparent to others and like the talent scout thing, a knack for it. You are likely to single out what's going to be a lasting phenomenon as opposed to yesterday's news. You're one of the best copywriters on the net. You're my #1 influence in terms of how to write email. I've been reading and studying your emails for 10 years. You have stability and consistency: You're steadfast in places where steadfastness is often under-valued which creates loyalty and a sense of security in those you serve." For anyone who is looking to transform their business and their life, I highly recommend you read and re-read Ken McCarthy's The System Club Letters: 57 Big Ideas To Transform Your Business and Your Life. This was a power-packed book filled with wisdom in areas such as copywriting, business building,direct response writing, internet marketing, direct marketing and advice that transcends business. And if you think this book is just for newbies, you're dead wrong! Experienced internet marketers and business people will also benefit from reading this book. Ken dispels some of the myths that are holding entrepreneurs back from achieving the business results they desire. In fact, Ken reveals a 3 step formula that was used by two guys who took an online discussion board and leveraged it into one quarter of a BILLION dollars in sales! This book is truly a 'Gem From the Trenches' and I highly recommend you add it to your library because by applying the information in it, you will have the ultimate competitive advantage! Author of the Amazon Best-Seller What's In Your Water?